The subtropical evergreen-deciduous broadleaved mixed forest is the largest extant natural vegetation type in southwest Hubei. However, little knowledge exists on the types and compositions (especially the relative ratios of evergreen versus deciduous species) of this forest vegetation. Here, we quantitatively classify the less studied forest vegetation into different community types, compare their size and composition structure, and analyze species-environment relationships which is the basis for further understanding the biodiversity maintenance mechanism and reasonable protection and utilization of this forest. We established 92 20 m × 20 m plots of subtropical evergreen-deciduous broadleaved mixed forest in two national nature reserves in Enshi, Hubei Province, China. All species with stems ≥1 cm diameter at breast height (DBH) in each plot were identified and mapped. These plots were classified by using two-way indicator species analysis (TWINSPAN) and detrended correspondence analysis (DCA). The species richness, abundance, basal area and importance value were chosen to compare structure, species composition and evergreen and deciduous ratio. Permutation-based multiple regression on distance matrices and multiple stepwise regression analysis were used to examine the relationship between species distribution and environmental factors. 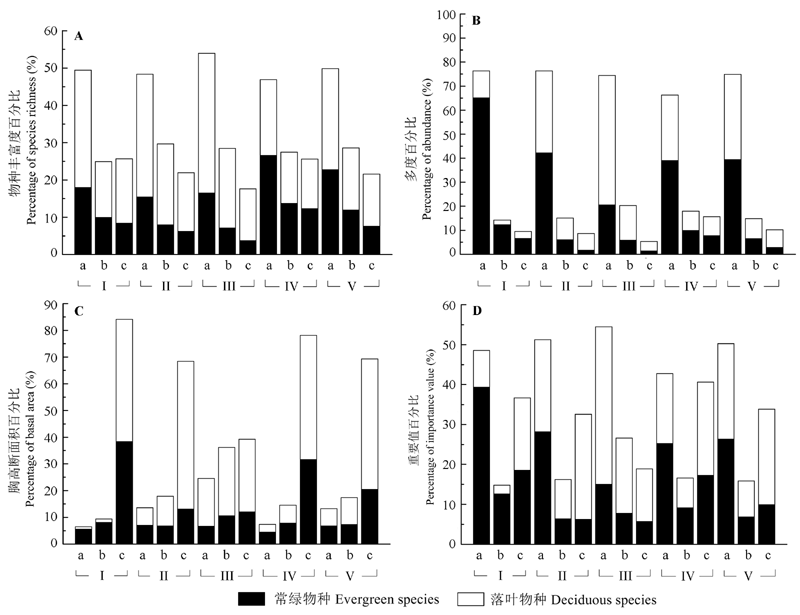 Our results showed that the subtropical evergreen-deciduous broadleaved mixed forest in the southwest of Hubei could be classified into five community types based on quantitative methods: i.e. Cyclobalanopsis glauca-Eurya alata + Camellia cuspidate (community type I), Carpinus fargesiana + Cyclo- balanopsis glauca-Eurya alata (community type II), Carpinus fargesiana + Cyclobalanopsis glauca-Weigela japonica (community type III), Fagus lucida + Cyclobalanopsis multinervis-Eurya alata (community type IV) and Carpinus fargesiana + Daphniphyllum macropodum + Lithocarpus cleistocarpus-Eurya alata (community type V). Species richness, abundance, basal area and importance value of evergreen and deciduous species in each community types were different. Deciduous species in community II, community III and community V were significantly higher than evergreen species in terms of species richness, stem abundance, basal area and importance value, but they had no significant differences in community I and community IV. The richness of deciduous species in most community types were higher than those of evergreen species, meanwhile the abundance, basal area and importance value of deciduous species in the small size classes (1 cm ≤ DBH < 5 cm) in each community types were lower than those of evergreen species. In middle size classes (5 cm ≤ DBH < 10 cm), the richness, abundance, basal area and importance value of deciduous species were higher than those of evergreen species in community II, community III and community V. However, in community I and community IV, the evergreen species were larger than deciduous species in the four indexes. The richness of deciduous species in majority of the community types were higher than those of evergreen species in large size classes (DBH ≥ 10 cm). The elevation, slope and aspect, soil total nitrogen content, soil total phosphorus content, soil available nitrogen content and soil available phosphorus content were the major factors affecting evergreen and deciduous species distribution across the five community types. HUANG Yong-Tao,YAO Lan,AI Xun-Ru,LÜ Shi-An,DING Yi. 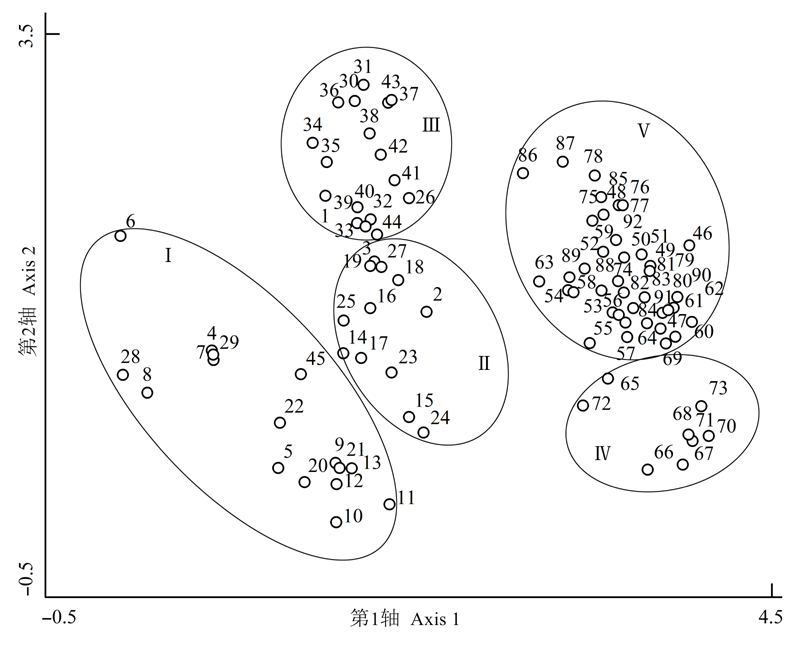 Quantitative classification of the subtropical evergreen-deciduous broadleaved mixed forest and the deciduous and evergreen species composition structure across two national nature reserves in the southwest of Hubei, China[J].Chin J Plan Ecolo, 2015, 39(10): 990-1002. 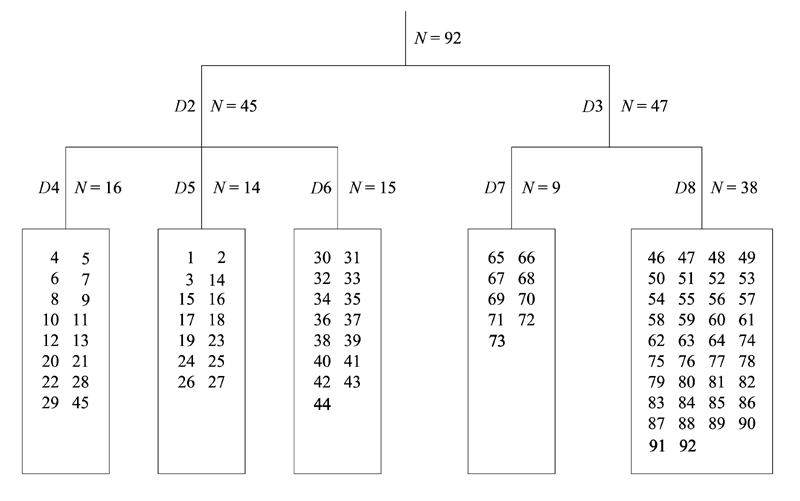 Dendrogram of TWINSPAN classification for 92 plots in the subtropical evergreen-deciduous broadleaved mixed forest across two nature reserves in Southwest Hubei, China. D, division number; N, number of plot." Two-dimensional DCA ordination diagram for 92 plots in the subtropical evergreen-deciduous broadleaved mixed forest across two nature reserves in Southwest Hubei, China. Roman numerals (I, II, III, IV, V) indicate different community types." 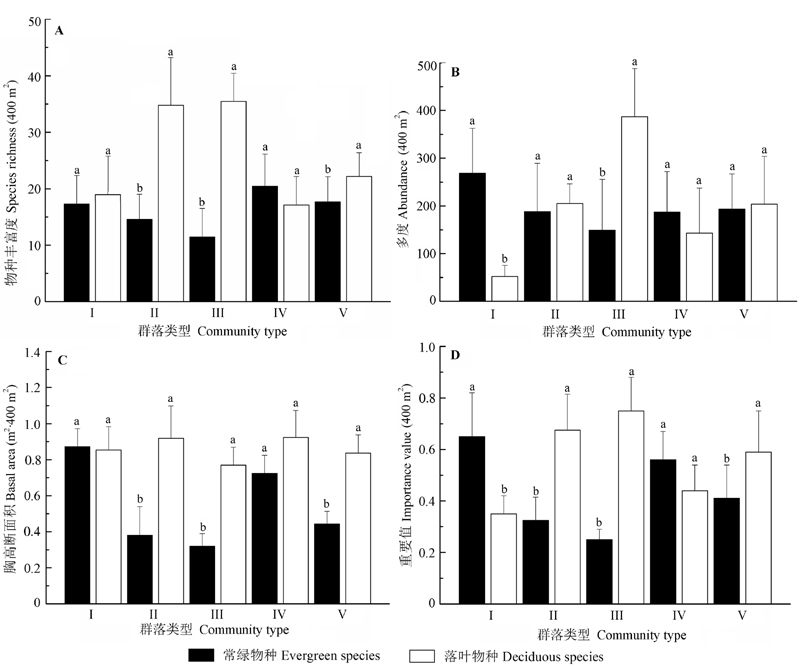 Importance value ( IV ) of the top 10 species in the five community types in the subtropical evergreen-deciduous broadleaved mixed forest across two nature reserves in Southwest Hubei, China"
Species richness, abundance, basal area and importance value of the five forest types in the subtropical evergreen-deciduous broadleaved mixed forest across two nature reserves in Southwest Hubei, China (mean ± SD). Different lowercase letters (a, b) indicate significant differences at the level of 0.05. I, II, III, IV, V indicate different community types: Cyclobalanopsis glauca-Eurya alata + Camellia cuspidata, Carpinus fargesiana + Cyclobalanopsis glauca-Eurya alata, Carpinus fargesiana + Cyclobalanopsis glauca-Weigela japonica, Fagus lucida + Cyclobalanopsis multinervis-Eurya alata, Carpinus fargesiana + Daphniphyllum macropodum + Lithocarpus cleistocarpus-Eurya alata." Evergreen/deciduous ratio of species richness, abundance, basal area and importance value with size class in subtropical evergreen-deciduous broadleaved mixed forest across two nature reserves in Southwest Hubei, China. a, DBH 1-5 cm; b, DBH 5-10 cm; c, DBH ≥10 cm; DBH, diameter at breast height. I-V see Fig. 3." Effects of environmental factors on species distribution in subtropical evergreen-deciduous broadleaved mixed forest across two nature reserves in Southwest Hubei, China"
Multiple regression analysis between species richness and environmental variables in the five forest types in subtropical evergreen-deciduous broadleaved mixed forest across two nature reserves in Southwest Hubei, China"
 Aerts R, Chapin FS III (1999). The mineral nutrition of wild plants revisited: A re-evaluation of processes and patterns.Advances in Ecological Research, 30, 1-67. Antúnez I, Retamosa EC, Villar R (2001). Relative growth rate in phylogenetically related deciduous and evergreen woody species.Oecologia, 128, 172-180. Bohlman SA, Adams JB, Smith MO, Peterson DL (1998). Seasonal foliage changes in the Eastern Amazon Basin detected from landsat thematic mapper satellite images.Biotropica, 30, 376-391. Bongers F, Poorter L, Hawthorne WD, Sheil D (2009). The intermediate disturbance hypothesis applies to tropical forests, but disturbance contributes little to tree diversity.Ecology Letters, 12, 798-805. Booth MS, Stark JM, Rastetter E (2005). Controls on nitrogen cycling in terrestrial ecosystems: A synthetic analysis of literature data.Ecological Monographs, 75, 139-157. Chabot BF, Hicks DJ (1982). The ecology of leaf life spans.Annual Review of Ecology and Systematics, 13, 229-259. Condit R (1998). Tropical Forest Census Plots: Methods and Results from Barro Colorado Island, Panama and a Comparison with Other Plots. Springer Science & Business Media, Berlin. Cornwell WK, Cornelissen JHC, Amatangelo K, Dorrepaal E, Eviner VT, Godoy O, Hobbie SE, Hoorens B, Kurokawa H, Pérez-Harguindeguy N, Quested HM, Santiago LS, Wardle DA, Wright IJ, Aerts R, Allison SD, van Bodegom P, Brovkin V, Chatain A, Callaghan TV, Díaz S, Garnier E, Gurvich DE, Kazakou E, Klein JA, Read J, Reich PB, Soudzilovskaia NA, Vaieretti MV, Westoby M (2008). Plant species traits are the predominant control on litter decomposition rates within biomes worldwide.Ecology Letters, 11, 1065-1071.
 de Faria Lopes S, Schiavini I, do Vale VS, do Prado Júnior JA, de Silvério Arantes C (2012). Historical review of studies in seasonal semideciduous forests in Brazil: A perspective for conservation.Brazilian Geographical Journal: Geosciences and Humanities Research Medium, 3, 21-40. Haberl H, Erb KH, Krausmann F, Gaube V, Bondeau A, Plutzar C, Gingrich S, Lucht W, Fischer-Kowalski M (2007). Quantifying and mapping the human appropriation of net primary production in earth’s terrestrial ecosystems.Proceedings of the National Academy of Sciences of the United States of America, 104, 12942-12947. Hawthorne WD (1996). Holes and the sums of parts in Ghanaian forest: Regeneration, scale and sustainable use. Proceedings of the Royal Society of Edinburgh. Section B. Biological Sciences, 104, 75-176. Kloeppel BD, Gower ST, Vogel JG, Reich PB (2000). Leaf- level resource use for evergreen and deciduous conifers along a resource availability gradient.Functional Ecology, 14, 281-292. Lechowicz MJ (1984). Why do temperate deciduous trees leaf out at different times? Adaptation and ecology of forest communities.The American Naturalist, 124, 821-842. Lichstein JW (2007). Multiple regression on distance matrices: A multivariate spatial analysis tool.Plant Ecology, 188, 117-131. Lomolino MV (2001). Elevation gradients of species-density: Historical and prospective views.Global Ecology and Biogeography, 10, 3-13. Malhi Y, Silman M, Salinas N, Bush M, Meir P, Saatchi S (2010). Introduction: Elevation gradients in the tropics: Laboratories for ecosystem ecology and global change research.Global Change Biology, 16, 3171-3175. Mueller KE, Hobbie SE, Oleksyn J, Reich PB, Eissenstat DM (2012). Do evergreen and deciduous trees have different effects on net N mineralization in soil.Ecology, 93, 1463-1472. Nogués-Bravo D, Araújo MB, Romdal T, Rahbek C (2008). Scale effects and human impact on the elevational species richness gradients.Nature, 453, 216-219. Oliveira-Filho AT, Jarenkow JA, Rodal MJN (2006). Floristic relationships of seasonally dry forests of eastern South America based on tree species distribution patterns. In: Pennington RT, Ratter JA eds. Neotropical Savannas and Seasonally Dry Forests: Plant Diversity, Biogeography, and Conservation. CRC Press, Boca Raton, USA. 151-184. Ozinga WA, Schaminée JHJ, Bekker RM, Bonn S, Poschlod P, Tackenberg O, Bakker J, van Groenendael JM (2005). Predictability of plant species composition from environmental conditions is constrained by dispersal limitation.Oikos, 108, 555-561. Poorter L, Markesteijn L (2008). Seedling traits determine drought tolerance of tropical tree species.Biotropica, 40, 321-331. Quigley MF, Platt WJ (2003). Composition and structure of seasonally deciduous forests in the Americas.Ecological Monographs, 73, 87-106. Reich PB, Bakken P, Carlson D, Frelich LE, Friedman SK, Grigal DF (2001). Influence of logging, fire, and forest type on biodiversity and productivity in southern boreal forests.Ecology, 82, 2731-2748. Reich PB, Uhl C, Walters MB, Prugh L, Ellsworth DS (2004). Leaf demography and phenology in Amazonian rain forest: A census of 40000 leaves of 23 tree species.Ecological Monographs, 74, 3-23. Song K (2012). Vegetation Characteristic of Evergreen- deciduous Broadleaved Forest Ecotone and Its Formation Mechanism, a Study in Anhui. PhD dissertation, East China Normal University, Shanghai. 50-60. (in Chinese with English abstract). Toledo M, Poorter L, Peña-Claros M, Alarcón A, Balcázar J, Leaño C, Licona JC, Bongers F (2011). Climate and soil drive forest structure in Bolivian lowland forests.Journal of Tropical Ecology, 27, 333-345. Williams LJ, Bunyavejchewin S, Baker PJ (2008). Deciduousness in a seasonal tropical forest in western Thailand: Interannual and intraspecific variation in timing, duration and environmental cues.Oecologia, 155, 571-582. Woodward FI (1987). Climate and Plant Distribution. Cambridge University Press, Cambridge, UK. Wyka TP, Oleksyn J (2014). Photosynthetic ecophysiology of evergreen leaves in the woody angiosperms—A review.Dendrobiology, 72, 3-27. Wen-Qiang XU, Liao YANG, Xi CHEN, Ya-Qi GAO, Lei WANG. Carbon storage, spatial distribution and the influence factors in Tianshan forests [J]. Chinese Journal of Plant Ecology, 2016, 40(4): 364-373. Hua JU, Guo-Zhen SHEN, Ming-Zhe MA, Jie-Lin GE, Wen-Ting XU, Chang-Ming ZHAO, Qiu- Liang ZHANG. Greenhouse gas fluxes of typical northern subtropical forest soils: Impacts of land use change and reduced precipitation [J]. Chinese Journal of Plant Ecology, 2016, 40(10): 1049-1063. Li-Ping TAN, Su-Xia LIU, Xing-Guo MO, Li-Hu YANG, Zhong-Hui LIN. Environmental controls over energy, water and carbon fluxes in a plantation in Northern China [J]. Chinese Journal of Plant Ecology, 2015, 39(8): 773-784. ZHANG Peng, LI Xin-Rong, JIA Rong-Liang, HU Yi-Gang, and HUANG Lei. Nitrogenase activity of biological soil crusts and its response to hydrothermic factors in the Shapotou region of northern China [J]. CJPE, 2011, 35(9): 906-913. LI Shan-Jia, ZHANG You-Fu, CHEN Tuo. Relationships between foliar stable carbon isotope composition and environmental factors and leaf element contents of Pinus tabulaeformis in northwestern China [J]. CJPE, 2011, 35(6): 596-604. HUANG Jian-Xiong, ZHENG Feng-Ying, MI Xiang-Cheng. 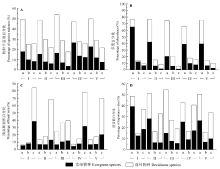 Influence of environmental factors on phylogenetic structure at multiple spatial scales in an evergreen broad-leaved forest of China [J]. Chinese Journal of Plant Ecology, 2010, 34(3): 309-315. BU Ren-Cang, CHANG Yu, HU Yuan-Man, LI Xiu-Zhen, HE Hong-Shi. 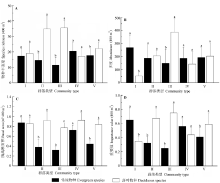 SENSITIVITY OF CONIFEROUS TREES TO ENVIRONMENTAL FACTORS AT DIFFERENT SCALES IN THE SMALL XING’AN MOUNTAINS, CHINA [J]. Chinese Journal of Plant Ecology, 2008, 32(1): 80-87. LIU Wei, ZHU Li, SANG Wei-Guo. POTENTIAL GLOBAL GEOGRAPHICAL DISTRIBUTION OF AMARANTHUS RETROFLEXUS [J]. Chinese Journal of Plant Ecology, 2007, 31(5): 834-841. LUAN Qing-Shan, SUN Jun, SONG Shu-Qun, SHEN Zhi-Liang, YU Zhi-Ming. CANONICAL CORRESPONDENCE ANALYSIS OF SUMMER PHYTOPLANKTON COMMUNITY AND ITS ENVIRONMENT IN THE YANGTZE RIVER ESTUARY, CHINA [J]. Chinese Journal of Plant Ecology, 2007, 31(3): 445-450. WANG Juan, NI Jian. REVIEW OF MODELLING THE DISTRIBUTION OF PLANT SPECIES [J]. Chinese Journal of Plant Ecology, 2006, 30(6): 1040-1053. LIU Wen-Yao, MA Wen-Zhang, YANG Li-Pan,. ADVANCES IN ECOLOGICAL STUDIES ON EPIPHYTES IN FOREST CANOPIES [J]. Chinese Journal of Plant Ecology, 2006, 30(3): 522-533. LIU Qiu-Feng, KANG Mu-Yi, LIU Quan-Ru. 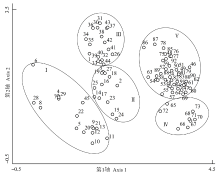 QUANTITATIVE CLASSIFICATION AND ENVIRONMENTAL INTERPRETATION OF FOREST TREE SPECIES IN HUNGOU, ZHONGTIAO MOUNTAIN [J]. Chinese Journal of Plant Ecology, 2006, 30(3): 383-391. LIU Qi-Jing, HU Li-Le, LI Xuan-Ran. PLANT DIVERSITY IN QIANYANZHOU AFTER 20 YEARS OF SMALL WATERSHED TREATMENT [J]. Chinese Journal of Plant Ecology, 2005, 29(5): 766-774. ZHANC Feng, ZHANC Jin-Tun, Shangguan Tie-Liang. PLANT DIVERSITY OF FOREST COMMUNITY IN ZHUWEIGOU OF LISHAN MOUNTAIN NATURE RESERVE [J]. Chinese Journal of Plant Ecology, 2002, 26(增刊): 46-51. WANG Yu-Hui. Analysis and Quantitative Simulation of Stomatal Conductance of Aneurolepidium chinense [J]. Chinese Journal of Plant Ecology, 2000, 24(6): 739-743. Zhang Cui-rong;Lei Xiao-uing;Zeng Wei-qiong and Yuan Gui-fang. Observation of the Flowering Biology of Schnabelia oligophylla and S. tetrodenta[J]. , 1984, 2(23): 80 -81 . Jie Wu;Minting Liang;Xiaojing Wang;Jianzong Peng*	. Agarose Blotting: a Simple Way to Observe Plant Epidermal Cells[J]. , 2008, 25(03): 332 -336 . Wang Zi-chun and Luo Gui-hua. The Recognition of the Evil Consequence After Deforestation in Ancient China[J]. , 1985, 3(03): 17 -20 . Cui Ke-ming. The Role of Plant Growth Regulators in the Control of Cambial Activity[J]. , 1991, 8(01): 22 -29 . JIANG Gao-Ming. On the Restoration and Management of Degraded Ecosystems: with Special Reference of Protected Areas in the Restoration of Degraded Lands[J]. , 2003, 20(03): 373 -382 .
 . [J]. , 2013, 48(3): 354 -356 . GUAN Jun-FengFAN Xiu-Cai FENG Chen-Jing WANG Yu-Tao LI Guang-Min. Changes of Cellular Ca2+-ATPase Activity During Maturation of Strawberry Fruits[J]. , 2003, 20(03): 325 -329 .
 . [J]. , 1994, 11(专辑): 65 . Sun De-lan;Wu Yi;Sun Long-hua and Jian Ling-cheng. Studies on Cryopreservation and Plantlet Regeneration of Panicum miliaceam Calluses[J]. , 1988, 5(04): 236 -237 . LI Zhao-liang YUAN Yong-bing T.H. Tsao. View of the Cytology and Biochemistry of Sexual Reproduction of Algae and Pteridophyta[J]. , 1995, 12(02): 1 -8 .